The Solar Type 7115-2 Transient Pulse Transformer is designed to be plugged into the SERIES terminals of the Solar Model 8282-1 Spike Generator. 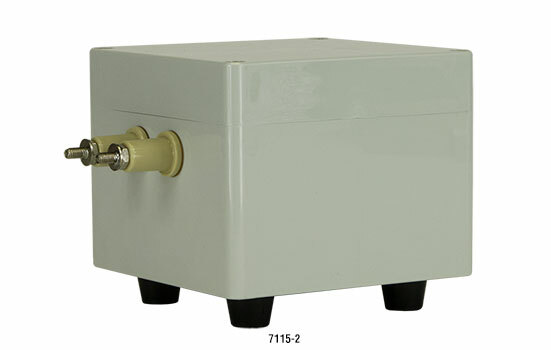 The pulse transformers are in an insulated case measuring 4.75" wide x 4.35 " high x 4.75" deep (12.06 cm x 11.04 cm x 12.06 cm) and fitted with banana plugs on the primary for insertion in the output terminals of the transient generator. Using the amplitude adjustment on the spike generator, the output of the Type 7115-2 can be raised from about 500 V to 15 kV peak. The shape of the transient is essentially the same as that produced by the generator unless the voltage breaks down the gap between the output terminals of the transformer (or gap in wiring connected to the terminals). The output terminals are ceramic insulated with metal parts separated by at least 0.5". The transient pulse or resultant spark across a circuit is adjustable from 0.5 to 500 pulse per second using the repetition rate controls on the spike generator. Since the output of the transformer is a very high impedance, any capacitance across it will reduce the available output voltage. Ideally, keep the interconnecting leads less than 6" (15.24 cm).